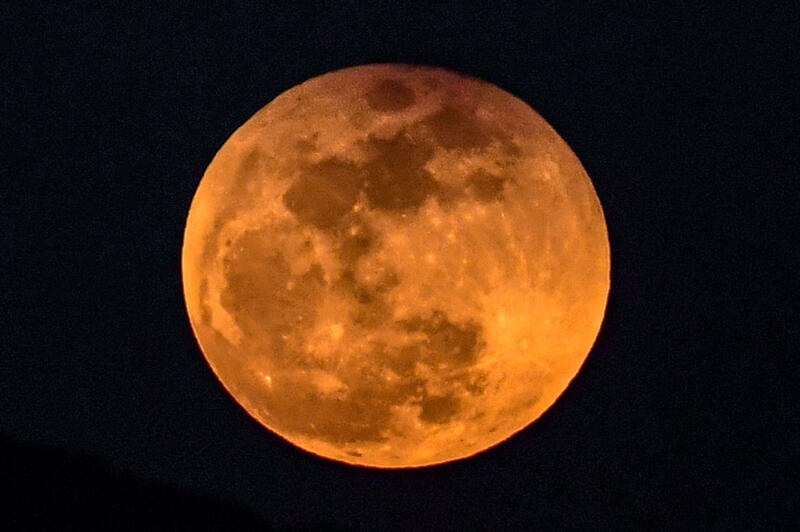 The longest "blood moon" eclipse in this century will coincide with Mars' closest approach to Earth in 15 years to offer skygazers a thrilling astronomical double bill on Friday, astronomers say. For about half the world, the moon will be partly or fully in Earth's shadow from 1:14 p.m. to 7:28 p.m. ET — six hours and 14 minutes in all. The period of complete eclipse — known as "totality," when the moon appears darkest — will last from 3:30 p.m. to 5:13 p.m. ET. "Totality will last for 103 minutes, making it the longest eclipse of the 21st century!" said the Royal Astronomical Society in London. At the same time, Mars will hover near the moon in the night sky, easily visible with the naked eye. Our neighboring planet will appear unusually large and bright, a mere 35.9 million miles from Earth on its elliptical orbit around the sun. "We have a rare and interesting conjunction of phenomena," Pascal Descamps, an astronomer with the Paris Observatory, told AFP. "We should have a coppery red tint on the moon with Mars the 'Red Planet' just next to it, very bright and with a slight orange hue itself." Amateur astronomers in the Southern Hemisphere will be best-placed to enjoy the spectacle, especially those in southern Africa, Australia, India and Madagascar. It will also be partly visible in Europe and South America. When the three celestial bodies are perfectly lined up, however, the Earth's atmosphere scatters blue light from the sun while refracting or bending red light onto the moon. It usually gives the moon a rosy blush. This is what gives the phenomenon the name "blood moon." Mark Bailey of the Armagh Observatory in Northern Ireland said the color can vary greatly. It depends partly on "how cloudy or transparent those parts of the Earth's atmosphere are which enable sunlight to reach the moon," he told AFP. "During a very dark eclipse the moon may be almost invisible. "Less dark eclipses may show the moon as dark gray or brown... as rust-colored, brick-red, or, if very bright, copper-red or orange." The long duration of this eclipse is partly due to the fact that the moon will make a near-central passage through Earth's umbra. That's the darkest, most central part of the shadow. Our constant companion will also be at the farthest point on its orbit from Earth, making its movement across the sky slower from our perspective, thus spending longer in the dark. NASA, meanwhile, has called out social media hoaxers claiming that Mars will appear as big as the moon during the eclipse. "If that were true, we'd be in big trouble given the gravitational pulls on Earth, Mars, and our moon!" the NASA website states. Mars will more likely appear as a very bright star, and viewers will need no protective eye gear. "All you have to do is dress warmly and go outside!" the Royal Astronomical Society advises. "If you want a close-up view of the moon as it turns red, a pair of binoculars is helpful." "All eclipses are spectacular," the society's Robert Massey added. "In the middle of a lunar eclipse it can look as if a red planet has taken up residence near the Earth -- they are both eerie and beautiful and I'll certainly be looking out for it!"